Cmsmart is a Marketplace, and we provide the excellent support to our customers, buyers, sellers around the worlds with different enquiries in a central ticket system. We sincerely make an apology for the inconvenience it will cause. However, your accepting attitude is greatly valued. May we meet again in the best of health! This support policy is applied for all product and services which is sold by Netbase team and Our Seller Partners on Cmsmart , Themeforest, Mojo Marketplace and Other sales channels. All the partners, clients and Netbase staff have to comply with the policy. Netbase Cmsmart team has the full right to update the policy any time and the change will have immediate effect on any support case since the day of revise. Answer your general questions about the item and how to use it. For example, how do I get my homepage to look like the one in the preview? Help you with issues related to using the item and getting the most value out of its functionality. Answer questions about third party assets or functionality (e.g. plug-ins) bundled with the item, such as how they work and other technical questions. If you installed on your Local Host, then you can't be supported. Please use English to write your issue. For every new issue, there must be 1 (min) - 3 questions (max) raised. Please leave only 3 issues open, if we find out that you have more than 3 issues is in progress, we will automatically close the remaining. A issue duration is 4 days after reply and waiting for your reply. Once the ticket is closed, we shall not consider it again, you please submit "new issue". Submit a ticket, providing them cpanel (your hosting account), ftp account and admin, account of your website. Please follow the ticket in a constructive way. There will be a person in charge who follows the process of handling tickets. If the issue is considered to be a customization, please being aware of paying the fee to fix the problem. More than 3 open issues is being followed. Questions about Magento or Virtuemart knowledgebase. You have to learn Magento, Joomla or Virtuemart by yourself. Disturbing the support team for too much talking. Giving implicit threats to the support team on the product bought. Questioning a customization without a willing for paying fee. If you bought something but you don’t feel satisfied, Cmsmart Buyer Protection Programe can help. With the objection is to protect our beloved customers on CMSmart market place, we are always improving the customer services policy towards the customers satisfactions. Further more, we would like buyers have a strong goodwill in buying our products. 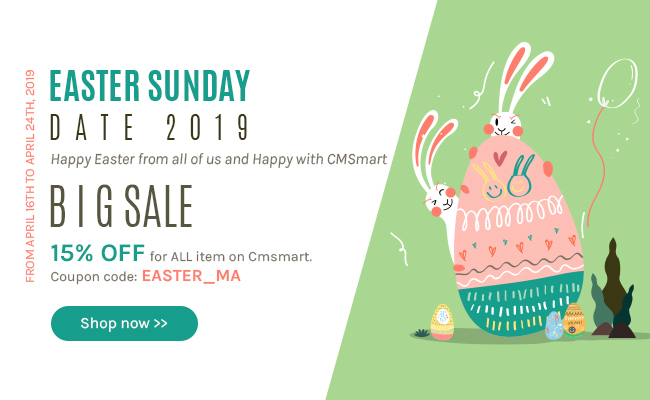 CMSmart’s Refund Policy reflects a 100% guarantee on buyers satisfactions, Marketplace assures to protect buyers’ right, we will give a full refund within 07 days. The client has never downloaded the item bought. As the system records their download times, so there will be a clear proof relating to this matter. Never request a refund for a product if you don't have ever used it and decide that you don't need it after purchased. All the same cases will be completely refused from our side. All the products listed on Cmsmart marketplace should be downloaded, upgrade and support within 6 months from the purchased date. After buying our products, you can access and download this products included its upgraded version if it is available on system. The product will not be able to be downloaded if it was un-published to be sold by seller or by marketplace for some reasons (not developed any more, or copyright infringement). Any new versions, bug fix, improvements…of the products will be notified to buyers who bought product within 6 months. Client does not have the right to request Netbase Cmsmart team and its partners to compulsorily update the new versions of product to be compatible with new CMS versions although we will try our best to provide the updates as we can. Buyer can download and support within 6 months. You can still receive public support via forum if your support expired. If you want to receive the private support, you can buy the private support for that package. Even when the client claim that they did not ever used the product within last 6 months, they still have to buy the new support period and we refuse to refund any case like this. In most case, please contact our support team and explain your situation so we can give a best deal to help you in a goodwill, but not compulsory case. User have to install the templates themselves base on the documentation. If the documentation is someway outdated and your following of its instruction lead to bugs, then please open a ticket support, explain clearly the situation, so we can investigate the problem and send back to you the latest documentation so you can install the themes yourself now and future. We refuse to install for you except we want to do that in your case. The theme is sold AS IT IS, it means that client have to check any details on how the themes works, what it has and what is its limitation. We will not able to provide support for any request that is more than the theme demo and the sale term explained what is included and what is not. We have the right to update product as we want and mostly base on customer request, but if will not be compulsory task. Media images of products and banners will not be included in the Installation Packages or Quickstart Packages and can be replaced with Placeholders. This method is complied with market rules to help protect the intellectual copyright of photos and images, and buyers have to insert their own product images to use after theme installation. Some of the special commercial extensions which is tested to be working well with each themes, can be seen on the demo, but is clearly stated on the product introduction information if is not included in the packages. Client has to read very well the introduction before buying the product. We will not agree to support or refund in these case of misunderstanding or misinformation. If we update the rules of product information, then we will very happy to provide the support for any purchase made before the update revise. We treat you fairly, clearly and we hope to receive the same. If something is not clearly, ask us before buying and our answer is counted for your support case. Customization of our themes to suite your website, is what all client will do after purchased. As a template developer, we always want to develop the theme layout framework as easily use as we can. However, we are not to be compulsory to do that, and the client buys the theme and agrees with its current feature or limitation. All the theme customization, you have to do yourselves, even with small modification. You know coding, and you can change and customize yourselves. You can hire our support team to do that for you. In case, you have done some modification with the themes, then we refuse to follow up fixing bugs or code conflict, or layout errors…that you un-intentionally created during your works. Most of these case, you can buy our customization services packages to working with your project. There are many other extensions out there on the market, and we will never have a themes can work with all the extensions seamlessly, even with different versions of the same extension. So, when you buy our themes, and install another extensions which is not from us, then any conflict, bugs, errors happened with the layout or with the functions of our theme or the extensions, then you have to contact the extensions developer and request to support. We will not able to provide the support in these cases. And if you want us to do it for you, then extra services fee will have to be applied. We refuse to provide the support, fix bugs or any problem that caused in case you install our themes, all of its or just a part of our themes, on your current working website, which is not a pure core CMS version. Most of the case, is your current website have modified core files of CMS, or install some plugins, this can conflict with our themes, and we will not provide support in these cases. And if you want us to do it for you, then extra services fee will have to be applied. After you install extensions purchased from us our your current website, and met a bug, then You can install our extension on core CMS versions to see if the bug happen or not. Our extension is tested in core CMS versions and mostly can work well on any CMS sites without heavily modified. In this case, we can help to investigate where can be the problem. If the problem is the conflict of a third parties plugins, then you have to contact that poduct’s developer to fix problem for you. If the problem is our product bug, we are happy to fix for you. If the problem is your mis-configuration, then we can instruct you and do basic set up for you. Many of clients want to upgrade your website with the latest version for CMS. Based on our experience working with CMS for a long-time, this is not always your right choice, and you should consult our support team before doing anything like this. This can be a serious problem. CMS (Jooma, Magento, Wordpress...) is often upgrading their core CMS versions with many changes in its functions and codes, most of us want to update the latest version for CMS and thinks it is better, but the case is always not in your expectation. This is due to many templates and extension will not be compatible with the new versions CMS except we can notify clearly in the product introduction page about this. Anytime we plan to upgrade our templates and extension to new CMS version, we have to do a lot of works, including modifying the code to ensure it work with both old and new CMS version, do testing all features again, update its front-end designs, revise the documentation and finally release officially with clearly stated on our introduction of product to all buyer, and update change logs also. Upgrading the product to the latest CMS version is not our compulsory although we always want to do that. A client will not have the right to request our support to upgrade our product to latest CMS version. Client has to read very clearly the Compatible section before purchasing, and even ask a question before buying or open ticket support to ask for our consultant. In your case, you update yourself CMS version, so we cannot help you to fix the conflict although we really want to make you happy. - Option 1: you restore the back up of your last version of the website. - Option 2: you have to pay for extra services for our team to work with this upgrade, and if you agree to go on, we still have to investigate your site to see how many modifications you did, which third-party extensions you installed, so we can give estimate times and cost. If we see that we can not help as your website did too much modification and install too many plugins, then we can only have to refuse the case of services processing. We are not required to support issues about your web hosting or server environment, or issues with the software you’ve got installed on your machine to use the item. Please check your ISP/web hosting provider or other software documentation that you’re trying to use to help solve your issues. - We do not guarantee the customizations (including customizations for free or charge fee) are retained when customers update their products to the new version. You are not allowed to update your website arbitrarily without our guide. If you want to update to the new version with the former customization, please contact us. Want to open a pre-sales questions, please comes to the product detail page, open Discussion tab, post a question and wait for the answer from seller and other contributers. Anything regarding your products, review process, withdraw transactions, disputes...please create a ticket to Marketplace team to be well-served. Seller forum here is also good to raise any questions.